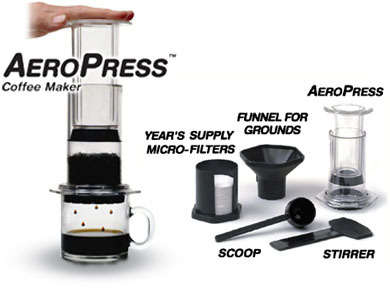 Aeropress Brewing good coffee or tea one cup at a time the easy way. Aerobie AeroPress 80R08 Coffee & Espresso Maker is a convenient portable coffee, expresso, or tea maker. We have the easy single cup brewing solution to give you the best flavor. We know you will be amazed at how much flavor and how smooth the tase of this brew is. This is not to to be confused with Arrow press. For those of you who like your double shot expresso ( I love starbucks) or and want an easy way to make your own cup o joe in the morning here it is. Simple actually with an awsome brew every time. No more expensive brews or waiting in long lines. Do you like your coffee strong and want that perfect blend? Well now you can make it to the strength you want and have perfection in every cup. It actually takes about 20 seconds to create the perfect blend by allowing the water to get pushed through the microfilter pads on the bottom. Be careful not to squeeze ever ounce out of the beans as this is what runs it as to much acidity can occur just lake any other coffee maker. This aeropress works on simple physics from the air pressure of you pushing the ground beans ( kona coffee from Hawaii are awesome) through the included filter pads and Viola you have in instant cup of your favorite beverage. Using tea that is in bags or loose already such as yerba mate ( This will give you a similar caffiene buzz but not the jitters associated with other types of caffiene.) Many folks report a eupohoric feeling with it and no crash at all. Coffee Beans ground in a grinder even chocolate or pepperment for added flavor. A note we will soon be offering Kona Coffee and other types of flavored ground beans for your to experience. Produce great flavor without the hassle of a cumbersome expresso machine. You can make 1-4 delicious cups of instant coffee with this machine that you are sure to love @ a great sale price with FREE SHIPPING USA all others 8.99. 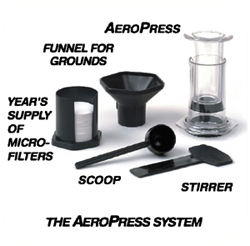 What makes The Aeropress so nice is the it comes with everything you need to have great great tasting coffee. A scoop and stirrer for the connoisseur. 1 Years Supply of micro filters. That's right a whole years worth so you should be able to enjoy your Espresso Maker for a long time and not have to spend Money on any other items.